You don’t have to be a start-up in the sharing economy to benefit from design thinking. Even a traditional sector such as financial services stands to gain from adopting its customer-centric focus. Applying design thinking to banking is the topic of a panel discussion Wednesday in the Barcelona campus by IESE Prof. Thomas Klueter and Josemaría Siota; Dieter Staib and Sam Taylor of Oliver Wyman consultancy; Raimundo Sala, managing director of PayPal; and Rob Brown, global head of marketing and design at BBVA. The starting-point for the discussion is an insightful recent report, Design Thinking: The New DNA of the Financial Sector, authored by the Klueter and Siota, together with Staib, Taylor and Iñigo Ania of Oliver Wyman as well, on ways to apply design thinking in the financial-services sector. Design thinking may provide the solution, according to the report, which seeks to answer the question: How can banks boost their growth by successfully applying design thinking in a de-banking era? But there will be obstacles to overcome. 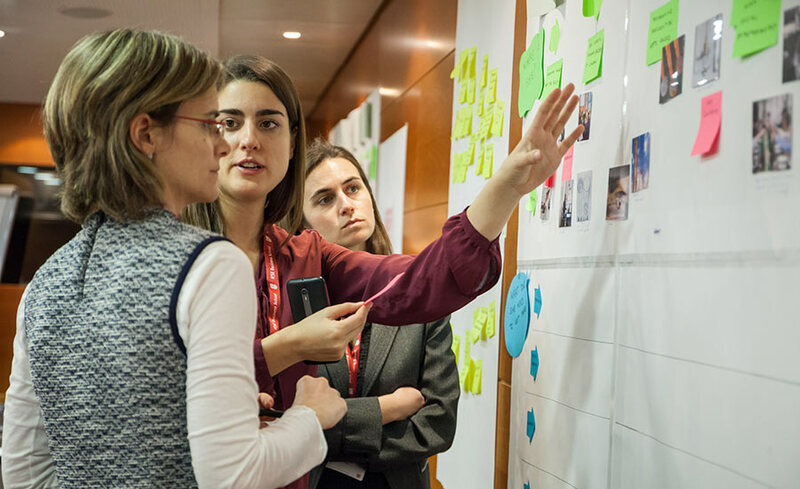 Design thinking puts new demands on leadership, teams and individuals; a recent survey found that 63 percent of those involved in innovation processes in the financial sector said design-thinking initiatives had not advanced. Empathize: Understand the problems and needs of end-users. Define: Review information and home in on the problem, setting specific goals. Ideate: Generate new ideas to solve problems. Prototype: Get the idea out there, quickly, to start receiving feedback immediately. Test: Directly seek feedback from the end-users. This process can help financial services companies understand customer needs and behaviors, allowing firms to build out prototypes, test and learn from them, and finally launch the products and services that will help them succeed. Improving the user experience will better banks customer relationships and add to the value proposition of the banks business model, the report says.